Friends, I have confession to share with you today. It's about my classroom. You know… my beautiful classroom. Last year, it wasn't ready on the first day of school. Oh it was pretty and lanterns were hanging. And people walked in the room and gushed about how lovely it was. But it wasn't READY. I didn't even have an alphabet posted. Or numbers, for that matter. There were so many factors involved with moving into our new building that my school could not control and so many changes I had to make along the way. The result? An incomplete classroom. And a very sad teacher. Each time there was a new setback (and there were many, many setbacks) I found myself in tears because my classroom would not be complete by the first day of school. But you know what? It was ok.
My students learned, I finished decorating the classroom slightly behind schedule, and we all loved the classroom a little more as a result of the delay. The above photo was taken during my students first few days in the classroom. We were just getting started with daily 5. The space above my whiteboard for showcasing the alphabet was still a work in progress, there were no number cards displayed on my freshly painted cabinet, and “classroom rules” poster wasn't hanging beside my framed subway art. Despite being in the midst of an incomplete classroom, every child had a book box and was engaged in learning. The decorations are wonderful, but at the end of the day, it's the engagement with new knowledge that really matters. By now, you probably know every well-decorated detail of my kindergarten classroom. 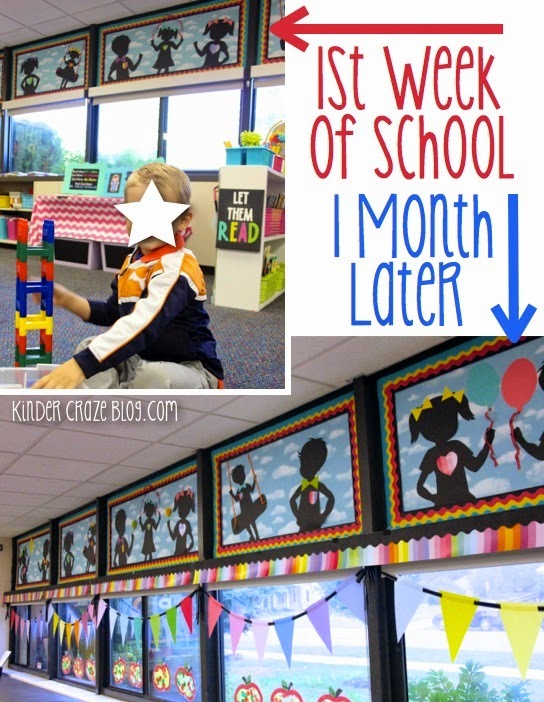 Today I invite you to join me for a behind the scenes peek into our days working and playing inside my incomplete classroom during the first weeks of school. By the first week of school, I had completed two of the black vinyl trees on my walls, but a lot of blank space still remained that I wanted to fill with two more decorative trees. I was also eager to put a sign on the door to the restroom and finally hang a number line in the classroom. It took a few weeks, but that corner of the classroom finally came together. Another big project to tackle was the completion of my classroom window decorations. 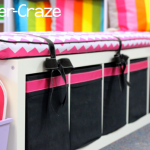 By the first day of school, but boards above my winders were complete and included silhouettes of children playing (available from Schoolgirl Style), but the windows themselves needed a little pizzaz. I added rainbow pennants and a striped border above each window (also from Schoolgirl Style.) The finished result was perfect – just slightly behind schedule. Of all the items missing from my classroom, the missing alphabet saddened me the most. Here you can see one of my students working on a puzzle to sequence numbers and the alphabet is completely missing from the classroom. The alphabet display was my biggest priority to complete as quickly as I could once students entered the classroom. I don't have an actual bulletin board above my whiteboard, so I needed to construct a space on the wall to resemble one. Below, you can see another photo from the first week of Read to SElf. Note that the mock bulletin board was slowly coming together. My calendar area and number display also needed a lot of work to fine-tune once students were in the classroom. It wasn't long before those details were complete as well. Of all the projects in my kindergarten classroom, updating my classroom library was the most time consuming. In late October, I added a few decorative touches to my IKEA bench. I used black ribbon to fasten the cushion in place so it wouldn't slide around each time someone sat on the bench. I also added a strip of magenta ribbon to the front of each box to give the bench a little added POP. The real task lay in labeling my classroom library. 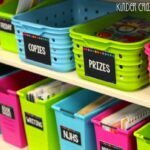 Prior to the first day of school, I made sure all of the books were sorted, leveled and arranged in my brand new colorful bins. The books were even labeled from my first attempt at library organization several years ago. I had a vision for how I wanted my new library to look, complete with new box labels and coordinating book labels. I knew this was going to be a big project to take on from scratch and I had a lot of other things going on (you know, things like lesson planning, teaching, maintaining the blog and spending time with my boyfriend/fiancé) so this task took a long time to complete. Students were given access to the library and they were well-trained in how to care for it. The library stayed in great shape, even without any book labels. Slowly, new labels were added to the books and library bins throughout the year. It took seven long months but by April, my library was finally complete! Starting out the school year with an incomplete classroom is definitely not the ideal. It was stressful, frustrating, and left me feeling like I had failed. But you know what? It was ok. My students thought the classroom was beautiful from the moment they stepped through the door. 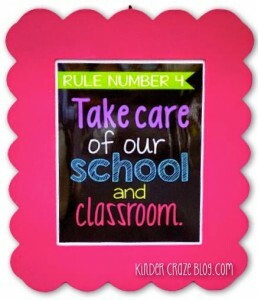 I told my class (as I always do) that I worked hard to make the classroom a really fun place for us to learn each day and I asked the each student to please do their best to take care of our classroom. I even made it into a rule. I have never taught a group of students that was more in love with their classroom. They knew I was working hard to make it even more beautiful for all of us. Each time I added something new, my class noticed. 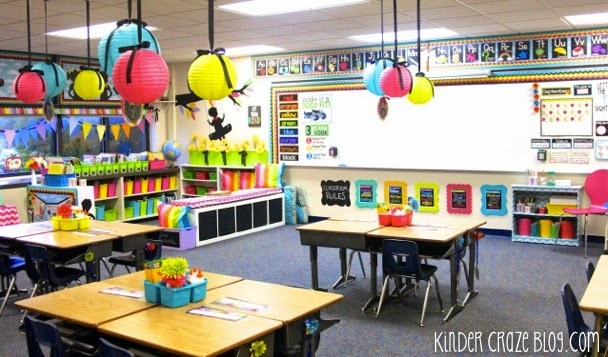 They actually came into the classroom each day and immediately searched for new decorations. They noticed even the smallest of details and loved every single one of them. When we did art projects, the children always proudly talked about how it was THEIR turn to make new decorations for our classroom. This year, my classroom will be 100% ready for my students when school begins. I taught summer school classes in my room throughout the summer so the decor stayed pretty much intact. The only thing that was truly shuffled around was the furniture. This is how the classroom looked when I stepped in the door to begin setting up. As every teacher knows, being able to keep my walls decorated throughout the summer is truly a blessing and I won't start the year in tears because my classroom will be all set and ready to go. But if it gets to be crunch time and you find your classroom far from where you hoped it would be, don't fret! 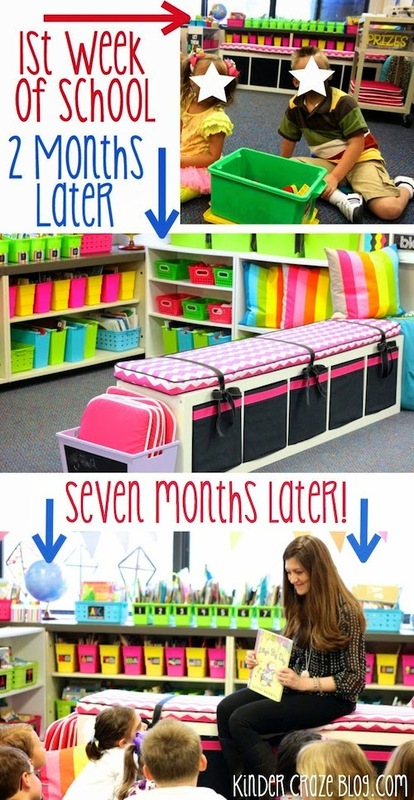 Just keep working on all of those details during the school year and your students will love the classroom (and you) all the more for it. 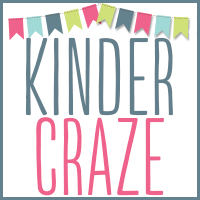 Are you following Kinder-Craze on Instagram? 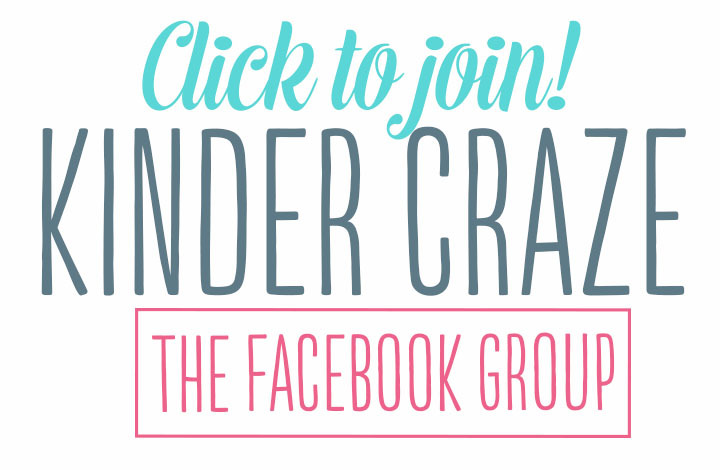 Come follow along to see sneak peeks of my upcoming projects and life behind the screen. I needed to read this. My kinder classroom isn’t finished being built yet. I am panicking as I usually have it done by now. We may only have 3 days to unpack boxes before meet the teacher night. Yikes. Where did you get your cute picture frames hanging under the white boards? Oh my goodness, that would be VERY overwhelming. Best of luck as you prepare for the new school year. You can do it! To answer your question, I purchased the frames from Michaels last year! Thanks for making me feel better about all of this! I know I’m not alone. This was a great post and reminder that even the most picture perfect teachers and classrooms aren’t always so picture perfect. Phew! I know I always feel very overwhelmed this time of year trying to make everything ‘just right’. Thank you for sharing! This will be a great read for a good friend so I will be sharing. Also, I love your ABC wall! Oh Maria I know exactly how you felt. Every time I’ve moved rooms I’ve had this same problem and you are so right. The kids notice every detail added. The love the room and appreciate it so much. This year my room won’t be ready again, and I will fret and hustle tomorrow and Tuesday but when I don’t get it all in I will be ok Because our classrooms are living breathing things and it is ok to leave room to grow. 🙂 Thanks for this reminder. The end result is fantastic! It’s a lot of work to move classrooms, much less start from scratch at a new school! I was wondering where your “Make it a good fit” and “3 ways to read a book” posters come from- I’ve noticed them in your last few classroom shots, and they are adorable! Thanks for sharing this. Teachers report back on Tuesday. Our carpet installation is scheduled to start Monday. The timing stinks. We have an inservice on Wednesday. Hopefully, my classroom will be done by then. It’ll give me one day to get set up before Open House. It’s not ideal by any stretch of the imagination, but I think I can make it work. You’re right, the kids will love the room. I remember when my school first opened. We got our certificate of occupancy for the building on Thursday and school started Monday. We didn’t even have furniture in our classrooms, let alone books and all our stuff. My room was bare to start with but grew and changed during the year. I can do this. I’m happy to see your lovely classroom as a reminder of that. Thank you. Oh my goodness, why does it have to be so stressful? Last year we had to spend the first 2 days of school off-site because we weren’t given our certificate of occupancy before the first day of school. I wish you a VERY productive day before open house. Best of luck! Wow! Beautiful room! Can you please tell me where you got the pink cushions for read to self that some children are using on the floor around the room? Thank you! Thank you so much Maria! This is truly encouragement and inspiring to me because I am moving to a new school district, school, and classroom. I only have 2 days to set up before all my trainings since I’m new to the district. It took hours just to unpack my boxes! I hope I get everything done in time, but like you said… I’ll keep working on those details and try not to fret! Thanks! Thank you so much! I needed this post. I have all your calendar pieces. I’m so excited to put them up. Do you put magnets on the back? I love, love, love your stuff Maria! I’m a big fan here 🙂 Thank you for being “real” with this post. I think everyone appreciates your openness, honesty, and transparency! I typically start with minimal “decorations” up. I have my calendar, ABC cards, #line, and center signs/student labels around the room, but as you showed most of the “decorations” BUILD as the year goes on. I leave my bulletin boards blank. I cover with paper and borders, but leave the rest for the kids to contribute with student work and class created anchor charts. Same with rules. We create them as a class with teacher influence of course. This was a great post. Thank you! Your classroom looks great! I just returned from maternity leave and I’m looking to decorate my room. Where is your easel from?? I LOVE your classroom. I can’t stop staring at it! I love your book bins. I know you mentioned that some were from Really Good Stuff and some were from Big Lots. Are the pink and yellow ones from Really Good Stuff? I am trying to locate some with similar dimensions. They seem taller than the ones I’m finding on their website and I like how clean it looks without the books poking up. Please help? What are the dimensions? Thanks so much! I think you said that the blue and green tall ones on your bottom shelf were from Big Lots and to check in the summer. If you have found them anywhere else, let me know. 🙂 Good bins are hard to find. The taller blue and green bins are definitely from Big Lots. I keep my eyes out for good bins all year long and I have never seen those boxes sold anywhere except at Big Lots in the summer. Best of luck setting up your library! I love your classroom! 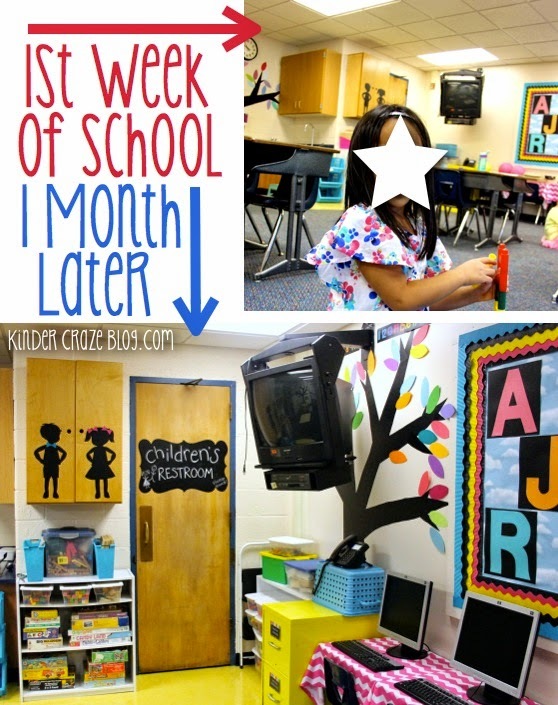 Where did you get your black decals from that have the classroom rules and children’s bathroom written on them? Hi Danielle and thank you! I purchased the decals from either Michaels or Target. (I did so much shopping one summer for my classroom, I cannot recall which of those stores had the large decals). At least that’s a starting point! Your classroom is absolutely BEAUTIFUL!! I am about to start my first year teaching Kindergarten! Can you tell me what you do on your Word Wall? I notice that in the beginning of the year the Letters are plain, and at the end of the year they are decorated with pictures (I’m assuming). Hi Lynn! Congrats on your first teaching job! 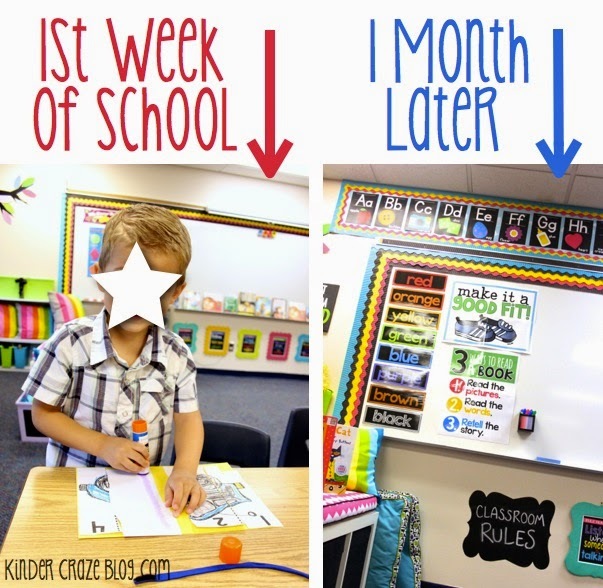 I get lots of questions about my word wall and I answered them all in this blog post. Enjoy! Maria I love your alphabet and number cards! 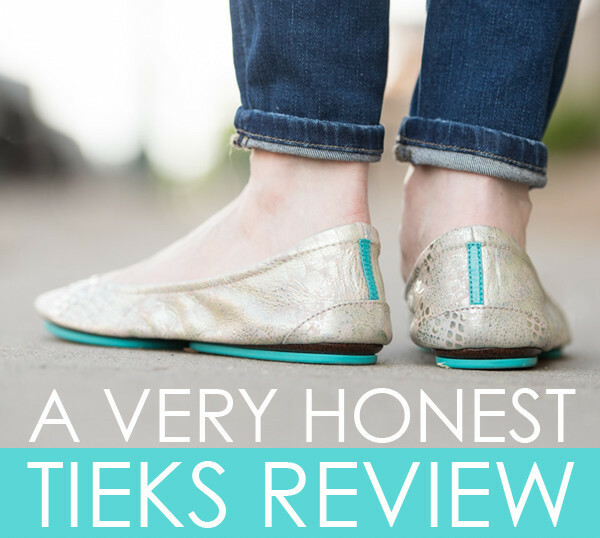 Do you have a link where they can be purchased? I love your classroom! I am moving from 3rd to K this year and looking for ideas. I was wondering how you sort your library and where you got the pink cushions the kids were using for read to self. Also, for your bench, did you get the IKEA bookshelf and turn it sideways? Everything looks so wonderful and inviting. Thank you for sharing. Hi Shari! I am so touched to read that you are a daily visitor of Kinder Craze. Thank you for that! Now about that bench cushion: I had it custom made using fabric from Hobby Lobby and a piece of foam that I purchased locally at a store called The Foam Factory. Someone really needs to start creating and selling this type of cushion because I have had SO many requests! This is exactly the post I needed to read! Even though it’s still July, my teacher mind is going a million miles per hour. 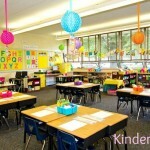 Although I am thinking about curriculum, my real love is classroom design! I always felt pressured to have everything ready for the first day, but having a new blog makes that pressure intensify. People expect the pictures they see to be perfect before a little one even walks through the door. I love the angle you took with this post. Seeing your classroom over time makes the images even more special. You can really see how the room has grown with your little kinders! You are such an inspiration. Meet you in Vegas and learning from you was an invaluable experience! Thank you so much! I was curious about your alphabet/word wall. The black paper that you put behind each letter, is that a 12 by 12 sheet or a regular 8 by 11? Those are 12×12 sheets of black cardstock. I hope that helps! Where did you get these cute colourful frames ? THANK YOU for this post. I just found out today that there is a possibility I may have to move schools. The kicker is that it may be either a couple days before school starts OR after school has started and the district looks at the numbers in all the buildings. My biggest worry was how I would get my room ready in time. This post has just help to give me some peace of mind that it’s ok if it isn’t ready. Thank you so much for that! You are very welcome! I’m glad you are feeling better and I will hope that you get into your classroom BEFORE school resumes this fall. Best of luck to you! Thank you! Your room looks fantastic. 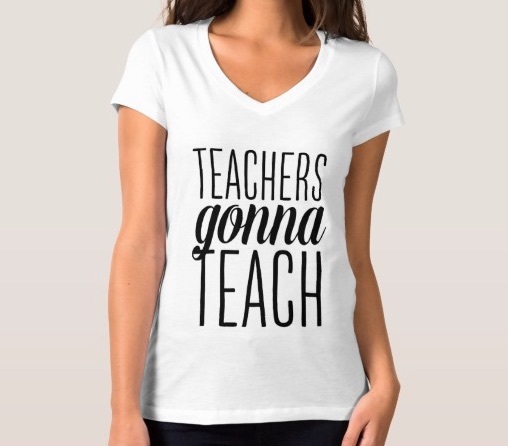 I am waiting to hear about a job switch and I am panicking thinking about classroom set up as I am currently 8 months pregnant! 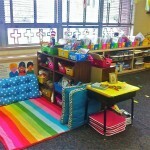 I keep thinking “There is no way I will get my classroom the way I want it before this baby pops out” and guess what?! It’s going to be okay!!! Yes, it will be ok; but I completely understand your stress level! Best of luck with the new school year and the new baby! I love this! Thank you for giving us permission to not be perfect. I love how your room looks and have one question: where did you get the posters – 3 ways to read a book and good fit? They don’t look to be handmade so I’m assuming they are bought. I just got asked to start a long term sub job in first grade. The classroom is an empty room. School starts Wednesday and I will only be able to work in the classroom one day to get it ready (and my lesson plans too.) This article is so helpful. The students will be loved, even if their classroom is mostly bare. Love everything about your room! It is so bright and cheerful. I was wondering where you got your bins with the chalkboards on them. Thanks so much! Thanks! I love Big Lots! I will have to see if they have anything like that now, but I seriously doubt it. I so needed to read this again. I am moving from a school where I set up and broke down each week so nothing could stay. Now I will be in a school where once on the wall it can stay, so looking forward to having a cute room. However, with construction and PD I won’t be able to get into my room….it may not even be ready for meet the teacher night. I’m frustrated and sad (tears). I know it will all be ok, just look at your beautiful room, but it is an emotional rollercoaster. Have a great year! I know those tears well and I know how frustrating it can be. You are not alone! So many other teachers are equally frustrated right now too. I needed this. It is my first year and I cannot get into my room until August 27. I am feeling very vulnerable and this read gave me some inspiration. Thank you. Hi Jaclyn, I’m happy to hear that I was able to bring you some comfort. You are definitely not alone! Thank you for this post!!! This year is my first year back to teaching after an 8 year break, my first year in a new school, first year in a new grade, and first year switching from public to private. My class is in a new building and is a newly added class, so there is NOTHING for it (like they had to order desks and chairs for me). We start school Tuesday, today is Sunday, and we haven’t even seen our rooms yet. I am trying very hard to just trust the Lord with the situation, but the worry is creeping up on me! Thank you for reminding me it will be ok! Bless you. I love this post! I would love to know what the kids are sitting on and where you purchased them! 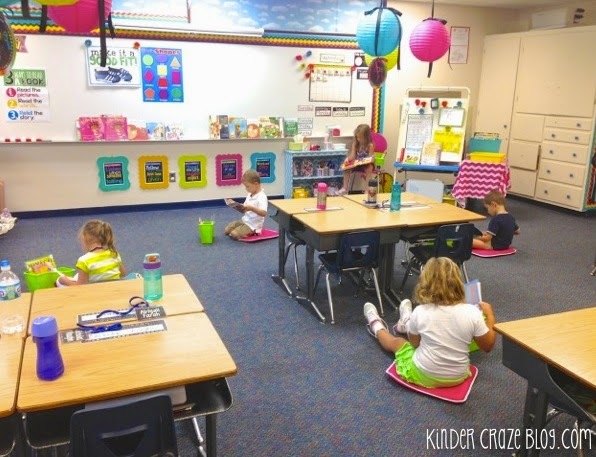 I really am looking into finding something like that to help me feel more comfortable with alternative seating. Thank you for being so open and transparent! Hi Del, they are sitting on cheap chair cushions that I found at Christmas Tree stores a few years ago. 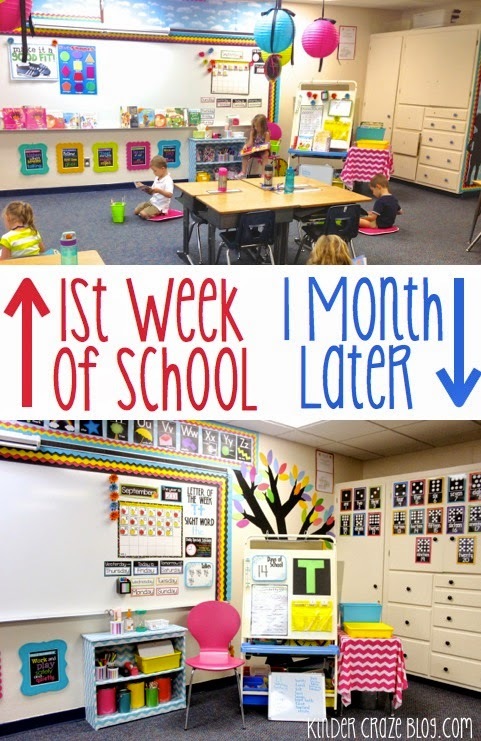 I am a Kindergarten TA and we are looping up with our class next year. 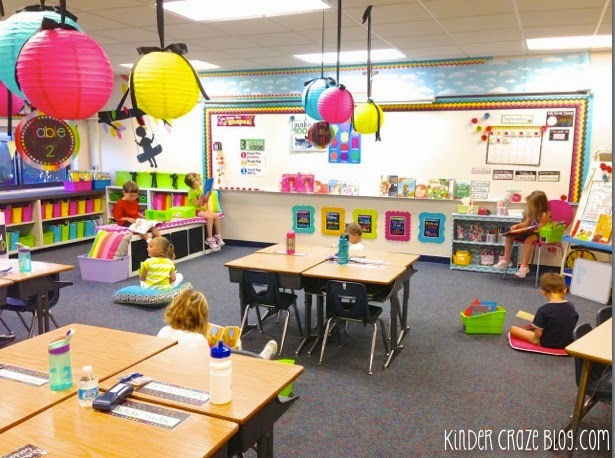 we have decided to do a new classroom theme and we love your room. I was wondering where we can find the alphabet line and colors set? we will be doing the Rainbow Chalkboard theme. I love your room and I’m wondering where you found your alphabet chart? I really needed to read this – our new campus won’t be finished until a week before school starts and I am sick about it. I haven’t purchased anything for my class decor yet because I don’t even know what my classroom looks like! 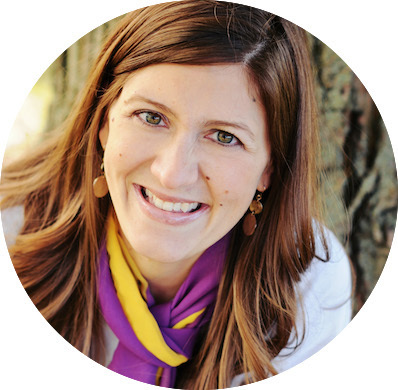 Quick question: Do you know of any teacher bloggers who teach half day Kinder? I teach at a 50/50 immersion school, so even though my partner teacher and I have our own classrooms, we switch classes half way through the day and have 44 kids total! Yes, that means everything in my class is labeled twice to display kiddos from each class (i.e. tables, student work display, class jobs, behavior charts, etc.) and storage and wall space is limited. I can use all the help I can get! Oh thank you, thank you, THANK YOU!!!!! I needed this too! I retired June 1 after 32 years of teaching first grade. 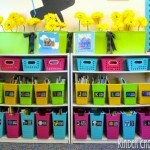 I gave all of my beautiful School,Girl Style decor to our preschool department. Now, I have been hired as a part time reading teacher. So I am starting over in new classroom that is so blah! But it’s OK! It will get done! Thanks for the encouraging words!! You are so very welcome. I know how terrible and overwhelming it can feel to know that your classroom isn’t exactly how you want it to be on the very first day of school. Congrats on your retirement and on your new part time position! I LOVE your classroom! 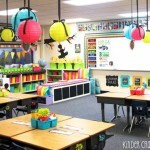 How did you add the black ribbion and bow onto your lanterns. I have lanterns and would love to have a bow on them. The wire “frame” for the lantern has a bar across the top. I attach the ribbon to that and just fasten s bow around the ribbon. I hope that makes sense! Also where did you buy the frames? Where did you get your bench for your library? I’m heading into kinder for the first time in 7 years and would love to add some benches.